Theatre of the D-Day landings, a long sandy beach stretches as far as the eye can see, inviting you to walk on the sands, to sunbathe or go for a swim. At low tide on the beach, you will soon see horses, either training or on a trek and sand-yachts driven in the sea breeze. You may even want to have a go yourself at one of those waterfront sports! Or you may fancy rock pooling… Mussels, cockles, oysters, crabs and even lobster if you are lucky are plentiful along the coast. You can also observe the work of mussel and oyster farmers! Marshland, peat bogs, seashore and nature reserves… different landscapes and natural sites offer the Cotentin a fantastic range of colours. The fauna and flora that thrives there is exceptional: storks, seals and rare sea birds… With the first autumn rains, the water level rises and rivers flood into the valleys, where horses and cattle grazed in the summer months. Come and recharge your batteries between the sea and the marshes and discover the natural sites all year round in the Cotentin. Lush vegetation, bird sanctuaries... discover rich natural sites. 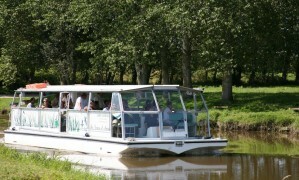 What's better than a river excursion to admire the beauty of nature in Normandy ?